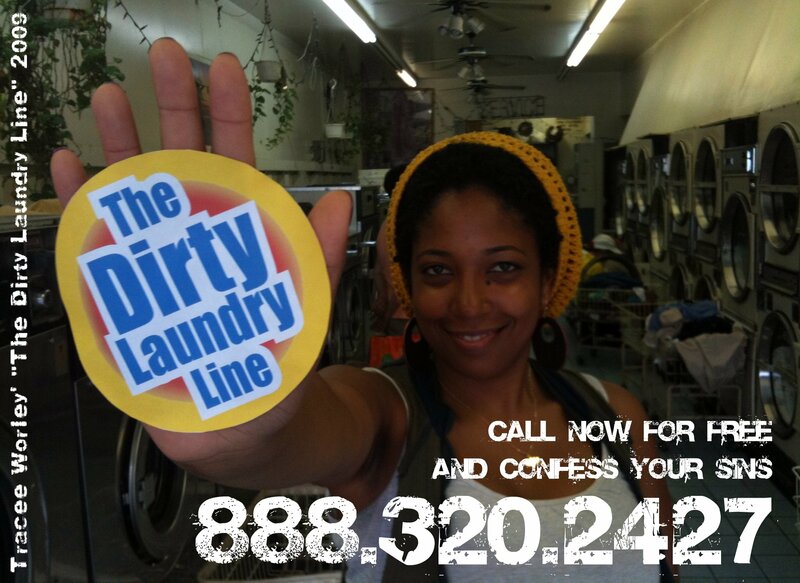 Tracee’s Dirty Laundry Line was an experiment in neighborhood communication, giving laundromat customers the opportunity to anonymously air out their dirty laundry in public or voyeuristically snoop through other people’s dirty laundry over a telephone hotline. She went around to local laundromats, leaving flyers and stickers which invite customers to call The Dirty Laundry Line. Curious callers were given the option to “press one” to anonymously “air out” their dirty laundry by leaving a message or “press two” to hear messages other callers have left. Tracee Worley is a BedStuy-based guerilla artist, teacher, prankster and rabble-rouser. Drawing inspiration from The Situationists and other urban interventionists, her participatory art projects aim to creatively disrupt public space. Frustrated by the inability of her training in the social sciences to adequately capture the complexities of everyday life, she began using art as a means to shape the future with more powerful interpretations of the world.